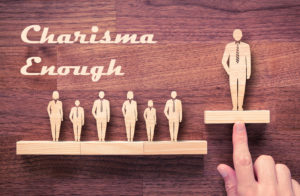 “Just a little more charisma can make a very positive difference in your effectiveness.” That is something we say in our book, Seeing Yourself as Others do. We have observed this phenomenon many times. It is helpful to have a scientific study support our pragmatic observations. … you can have too much charisma. Let me give you a simplification of the study. The Hogan Assessment percentile scales from 1 to 100 can be looked at as low, medium or high on each of the scales. The study found that leaders who scored low or high on the charisma scales were less effective. Bold scale: Conviction and confidence. Colorful scale: Optimistic, expressive and captivating. Mischievous scale: Push the limits and explore the unknown. There is a high correlation with those showing a medium rating on the Charisma scale for leadership and organizational effectiveness. These leaders are most effective when there is a strain on the organization. They are able to communicate a direction and motivate others to follow their direction. They are often more directive and less collaborative as leaders. Charismatic leaders, who are also more collaborative, create more engagement when there is opportunity more than difficulty. They are able to maintain the leadership position for longer periods of time with more engaged followers. Bold scale: Overconfident, narcissistic with high hubris. Colorful scale: Manipulative and attention seeking. Mischievous scale: Excessive risk taking. We have all seen leaders who fit this profile of high charisma taken to a counterproductive extreme. The larger-than-life personality hired to “save” a company, who does more damage than good, fits this profile. That is an example of being too high on the charisma scale. If we are low on the charisma scale, it is helpful to increase charisma somewhat. Communicate with more conviction, optimism and expression than might come naturally. It contributes to your effectiveness. It is helpful to realize that a medium amount of charisma is the most effective.